I'm really enjoying Dolomite Precipitation: https://www.nexusmods.com/skyrimspecial ... mods/8006/ which changes the look of rain and snow to be much more attractive but without altering weather patterns. YMMV, as always. Whatever works for you! Yes, the Dolomite Precipitation mod was what I was looking for, Flat. It gives the vanilla weather that tweak it was missing, thanks! And I almost forgot, this tidbit deserves an airing here: http://www.pcgamer.com/skyui-launched-f ... l-edition/. I've been using a doctored version of this UI I found by accident but it's nice to see some progress being made. The news about the Skyrim Special Edition version of SKSE being in alpha, and thus allowing SkyUI to work (again), is actually shown in Steam when Skyrim is being updated to impose the worthless "Creation Club mods are now available!" text on the in-game main menu screen. I never bother with the Steam stuff, Flat. The Nexus is my only port of call. So after a week of trial and tribulation creating my almost perfectly modded game in SSE, Bethesda come along and reintroduce their dirty masters. Why on earth they don't clean them up themselves is beyond me. I haven't found a single mod (from any source) that I've needed to clean apart from their masters. Everyone else seems to have got the message! Some great efforts being made by members of the Nexus community to make available Oldrim mods for the SSE version. I also like the new layout for the sites that the Nexus management have introduced recently. I've been playing Skyrim A lot lately, my current character just reached level 86, I plan on playing using this character until I become a millionaire in septims. 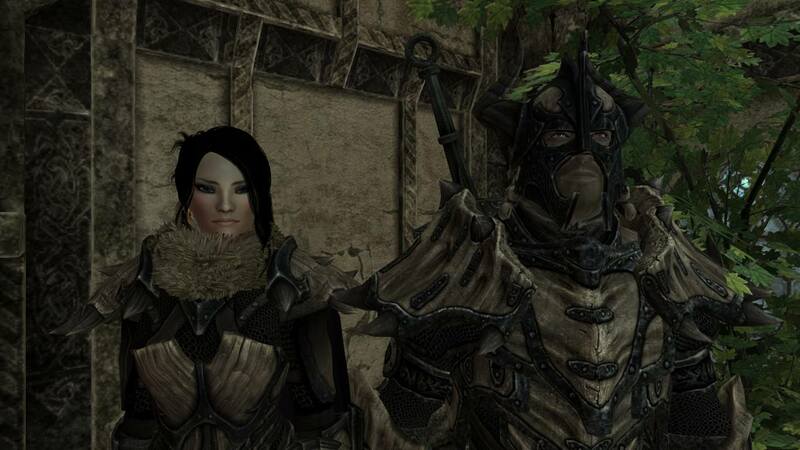 Here's a picture of my current character (shes the one on the left) with a character I modded in. Last edited by Zorathex on Tue Jan 09, 2018 5:37 pm, edited 1 time in total. I've been playing Skyrim A lot lately, my current character just reached level 86, I plan I playing using this character until I become a millionaire in septims. That shows dedication to the game, Zorathex. I note you seem to be playing with only one companion. Are you playing the game on the default level of difficulty? I must admit I've never played Skyrim as a female. I like your character BTW. I note you seem to be playing with only one companion. Are you playing the game on the default level of difficulty? Yep, only one companion, I'm also playing on legendary, it wouldn't be fair otherwise. That's even more impressive and a real challenge! I like a team of about four or five which makes it more like one of the older games I used to play called Baldur's Gate. I've no plans concerning the number of septims I'd like to amass but I do like my game to be well ordered. There's a really good mod called the Elysium Estate which gives me a home just outside Whiterun allowing me to collect weapons and armour etc. in an orderly fashion. This speaks to the collector side of me. In previous games it was hard to find some of the items I'd collected. Just curious, what is wrong with the houses from Hearthfire You can store and display a great deal of items in them. I was never happy with Hearthfire, fox, IMO it was the worst of the official DLC. I've never been one for building houses so to find something of the quality of Elysium Estate was a godsend. If you're happy with Hearthfire that's no problem, if you prefer something that's been crafted with love and shows real quality I suggest you add this mod to your game. A great deal of thought was given to what a player might/would require in this mod, I only wish I could say the same about what you get in Hearthfire. I use Amethyst Hollows Dreamworld, it's beautiful, well designed, has plenty of display space, it's got a tightly packed crafting area, and it even has auto sorting... ever since underground hideout in Fallout 3 I've decided to make auto sorting the top priority when looking for player homes. I tend to concentrate all my assets in the one property now, Zorathex. In previous games, they were spread across the map. With Sofia (who can carry enormous amounts of gear) included in the team, it doesn't make any sense to spread my stuff about. I disabled fast travel right at the beginning of the game but included a mod that gives an enhanced carriage service from those locations which were left out of the original vanilla setup. I've also included the mods which help to organize followers and the horse mods which make travel more pleasurable. It really comes down to the sort of game you want to play. I'm laid back in my approach and prefer to take my time and enjoy a less aggressive experience.